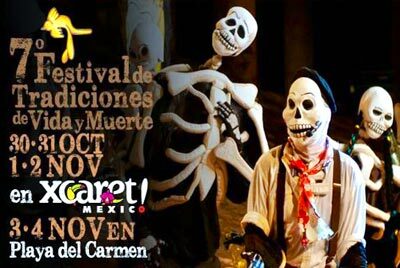 The Festival of Life and Death Traditions in the Riviera Maya is a fantastic place to celebrate the Day of the Dead. Take part in this special holiday by making offerings to your ancestors and loved ones, and come and discover Mayan culture and Mexican customs at this wonderful festival. Read on to discover some of the attractions and activities you can enjoy during this much awaited event, which will be held at Xcaret from October 30 to November 2. This is one of the most traditional aspects, which has been prepared with the help of excellent actors who pay humble tribute to numerous stories and legends. Check the listings when you arrive at the park to see the different shows offered and the schedules. This year the program includes two gala concerts featuring Lila Downs and Jaramar. With songs and verses talking about life, love, passion, and death, the compositions of these artists and the exciting fusion of international sounds will astound you. During your time at the festival you'll also hear the rhythms of local music and musicians, including Xcaret's marimba players, a pre-Hispanic music concert, and the Ka Zijil string quartet, among others. Admire the talent and agility of the dancers as you watch shows incorporating pre-Hispanic, contemporary, acrobatic, and folkloric styles. Some of the dancers will also impress the audience by showing off their skills using objects that restrict their movement and challenge their balancing capabilities. In this area, discover how important dignitaries were prepared when they died, and other Mayan archeological secrets. Come and be regaled with stories, tales, and legends, and find out about how the Mayans buried their dead. Take part in the workshop, and learn how to make the chocolate drink Xocolatl the way the ancient Mayans did. This section includes workshops and activities for all ages. Here, even the smallest of visitors can learn how to make amaranth offerings for the death gods and find out about the animals from the underworld. You can also play games and solve Mexican riddles, play pre-Hispanic instruments, make funerary masks, search for treasure, and much more. Don't miss out on the food! People from different parts of the peninsular, from the states of Campeche, Yucatan, and Quintana Roo, come to the festival every year to exhibit and sell traditional Day of the Dead cuisine. The festival brings together the best handicrafts, sculptures, and works of art, along with a gallery displaying the results of the popular Day of the Dead photo competition. At the Mexican cemetery in the Mayan Village area you'll be amazed by the colorful tombs, while throughout the park you'll be able to talk to numerous characters from the Mayan funerary world. Book your accommodations in one of the hotels in Playa del Carmen or the Riviera Maya and be sure to visit the Festival of Life and Death Traditions at Xcaret.